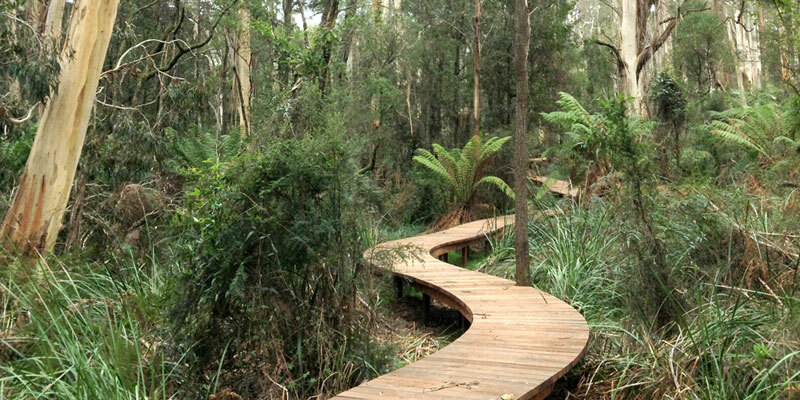 The National Trust’s Endeavour Fern Gully lets visitors experience the original natural environment of the Mornington Peninsula. This 27 hectare property includes 17.5 hectares of rain forest a meandering creek and a lush fern gully. The remaining 9.5 hectares are gradually being re-vegetated by volunteers. The remnant bushland is rich in flora, fauna and habitat diversity providing an important biolink in this area of fragmented habitat. Endeavour Fern Gully is open free of charge to the public 7 days per week and includes a 30 – 45 minute 2 km loop walking track with interpretive signage. There is a fairly steep downhill approach track and the same ascent on the way back. The property is closed on days of Total Fire Ban. Entry to the site is opposite the Red Hill Recreation reserve. Park in the top paddock and access the nature trail through the gates but please leave them as you find them. Sturdy footwear is recommended and be aware that leeches and snakes are found in this habitat. Dogs, horses and bikes are prohibited in this reserve. Please do not venture off the track. A small donation would be most appreciated to help maintain this property. Phone 9656 9804 for more information.